The Two Sheds Review: The WAW Archive is Complete! So there you have it. After nearly two months, and with countless hours spent trawling through the old sites I used to write for and scouring the Internet Archive it's done. My World Association of Wrestling archive is back online, for the most part anyway. I've also added some of the pieces written before December 2001 and after November 2005, including the piece which led to a Facebook group being set up advocating violence towards me! Don't go looking for it, it's not there any more! You know what I think is really sad about all of this? None of this work will be acknowledged by WAW itself, which I think is a great shame. If my recent communication with the powers-that-be has shown it's that the company has re-written it's history, it's erased me from it's past. But guess what? I'm fine with that. Judging by the response and the feedback I've recieved from some of those I wrote about they're happy to see this work back on my blog again. As I said before there's some great pieces here, and I think it's about time that they saw the light of day again. In fact putting this work back on my blog has had a staggering effect on the hits I've been getting. Back when I was hardly doing anything here this blog averaged around 2,000 hits a month. The past month alone the amount of visits has more than doubled to around 5,000 hits. 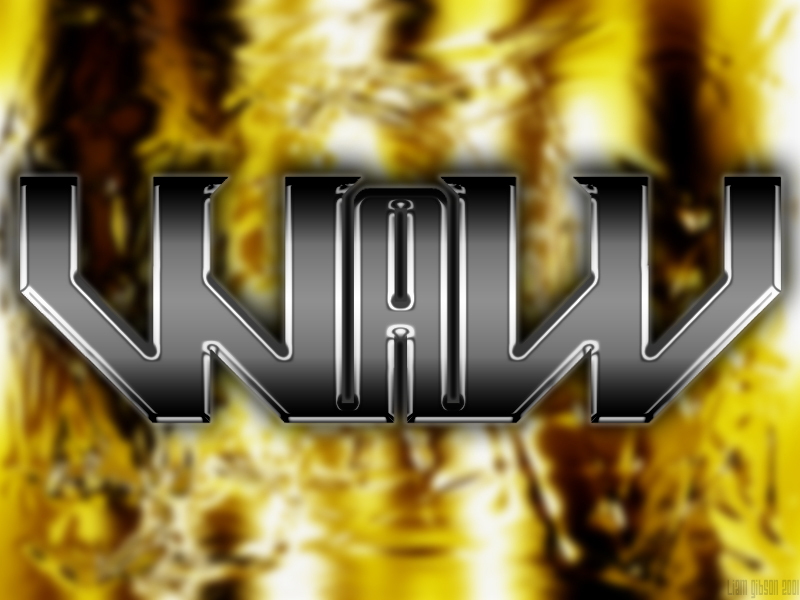 WAW will probably try and take credit for this, even though they don't want anything to do with me or this work, but once again I'm fine with that. I wish them nothing but the best with their film and their upcoming mega-show. So to all of those who have visited this blog in the past few months, I'm going to sound quite humble and say a massive THANK YOU to you all. Thank you for re-living these memories with me, for accompanying me on this journey back into the past. I hope you've all enjoyed this trip as much as I did. 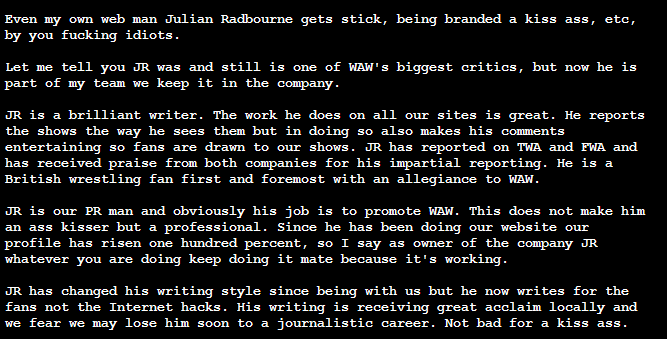 And just to show that there was a time when WAW appreciated what I did for them, here's something I found during my extensive search on the Internet Archive, a screen-grab from a piece written by the head honcho himself, "Rowdy" Ricky Knight, sometime around 2002/03, and taken from the website I used to run for him. You might want to download this image and keep if for yourself, because you'll never get him to actually say this himself.